One of the problems with reviewing lots of cars is forgetting the car you just got out of so you can look at the one your about to review with a clear mind. The main problem I have this morning is forgetting the Mondeo I just got out of, and that’s hard. You see I was driven here to pick up the Passat, so I was a passenger. Ordinarily I hate being a passenger, I become really critical of the driving style but because I was in a 2004 Mondeo I felt safe and comfortable, even though we were on back roads going very….very fast. So after being driven here at the speed of a time machine I was presented with the keys of the Passat. This version was released in 2005 and it’s looking its age now. The exterior styling is bland and awkward looking, I suppose its best described as middle of the road; it’s not offensive but it’s not exciting either. From the front the goatee beard chrome inset and headlight arrangement looks good enough, but you loose the will to live when you look at the shape from the rear, other than the LED lights there’s nothing to see here. The boot in terms of size is 565 ltrs, and that’s huge but it’s let down by the U shape opening and boot lip. In real terms getting a large box shape into the boot would require some manly jiggling. The interior space is large, comfortable for 5 passengers. It’s not space that’s the problem in here; it’s the somewhat Spartan styling. Don’t get me wrong, everything you need is in here it just looks empty; it looks as if someone with penchant for minimalist design was let loose. The switch gear will be familiar if you’ve driven any VW/Audi/Seat/Skoda as it’s taken from the common parts bin, even the electronic handbrake is the same one found in the Phaeton. The wooden inlay looks out-of-place against all the chrome down the middle, and some of the plastics used are a bit harsh. Build quality isn’t what it should be either, some of the door panels feel flimsy and somewhere around the glove box started to squeak incessantly as soon as I started the engine, but a few bangs of the door and it stopped. Speaking of the engine, this one is a 2.0ltr TDI 140bhp which is smooth and quiet enough. It pulls well though all the gears, once you get up to cruising speed it settles down to being what big VW’s are, mile munchers. The drivers’ seat is firm and supportive, and the suspension is good over the bumpy bits, but at low speed you can feel every stone on the road and don’t get me started on speed bumps. The flat top speed bump is a great test of suspension because it flexes the chassis along with the shocks and springs. Most cars will bounce over them and you won’t notice anything, the Passat judders over them leaving an unpleasant feeling of sideways motion at the rear. I took it down some back roads I know well just to see if I could coax a little laryness from the sedate German. While it’s fairly sure-footed, it did feel like it was struggling to keep hold in places, and the Traction control kept butting in trying to rein in the 140 horses. With the Traction control off the front wheels just couldn’t cope with steering so tonnes of under steer. Speaking of steering, it’s way too light and a little vague, when at a standstill there are flat spots in the turning circle it feels like there’s air in the fluid. 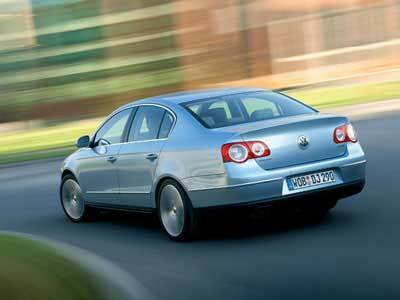 Even with all the problems the Passat is still a competent car. In 2005 much sales talk was made of the electronic handbrake, LED rear lights and the umbrella in the door but times have moved on and most of the equipment in the Passat is standard stuff now. I’ve heard the Passat best described as a “Child proof work horse you can drive in public” and that’s it to a tee. If you look at the numbers the Passat on paper is very big, but it just doesn’t feel that way. Overall the Passat is dreary to look at and boring to drive, add all that to a 5 year production and a new model due shortly and you’ll find that the Passat is outdated, outclassed and overpriced. The Comfortline starts at €30,485 for the 2.0ltr Diesel, but play with the options and the sky is the limit. 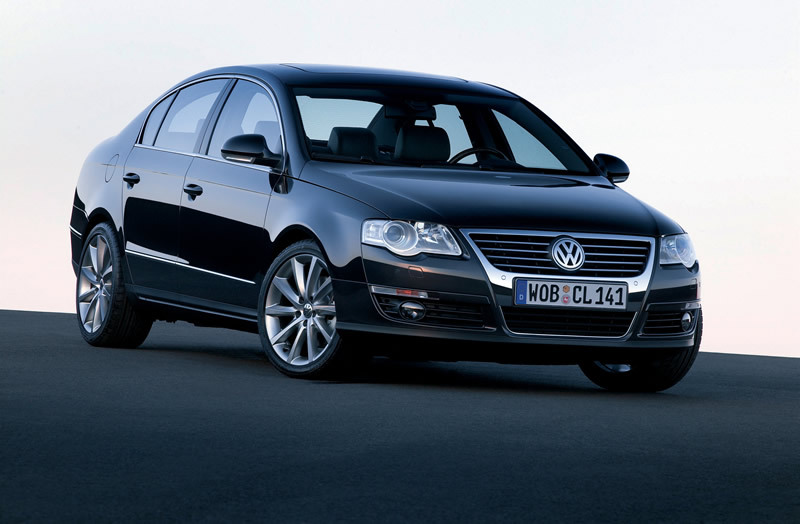 There are plenty of used Passat’s out there, there’s even a lot of Highline models but I wouldn’t bother. It will bore you, and make you seem uninteresting. The conclusion is, if you want a load lugger that will seat 5 adults and will breeze about in total comfort then buy a Mondeo.